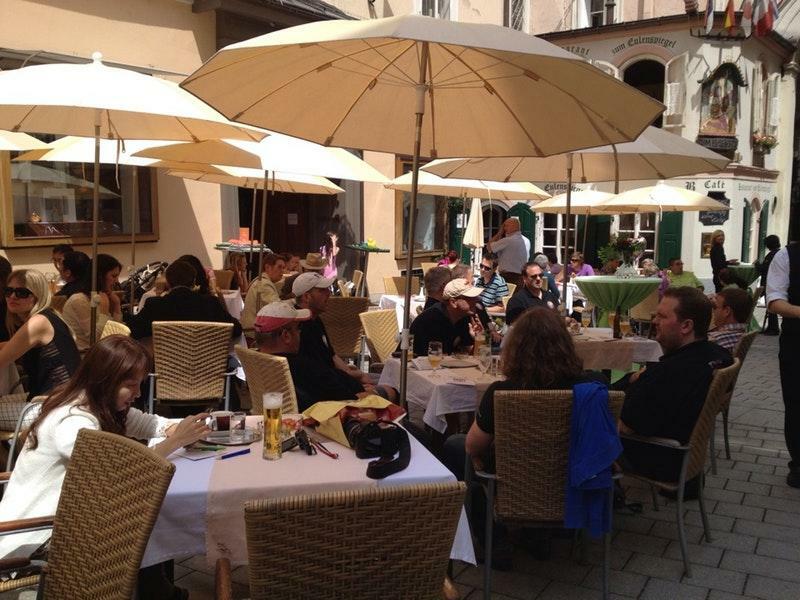 You can visit this restaurant if you appear to be near Salzburger Altstadt. 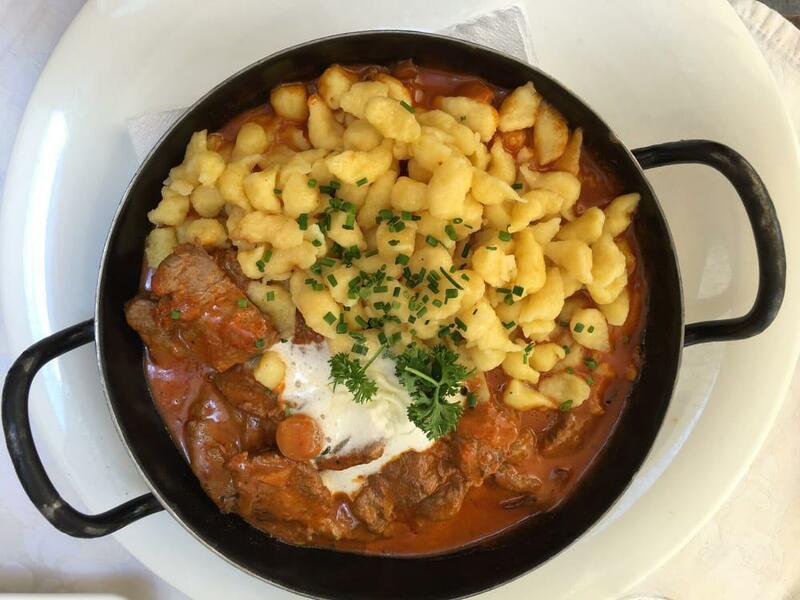 Austrian cuisine is to the pleasure of all clients here. 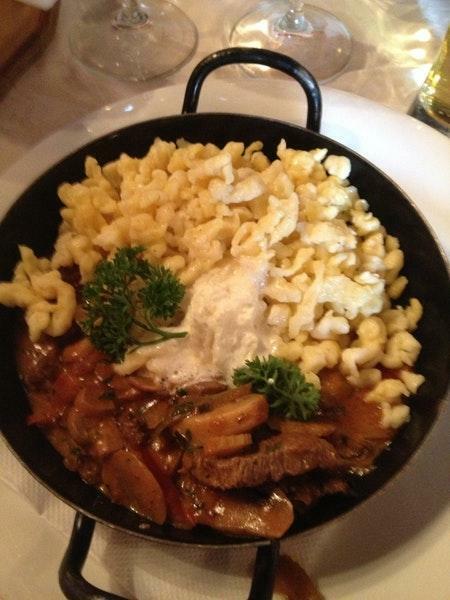 You will be served tasty wiener schnitzels, escalopes and potato soup. It's a pleasant experience to taste good kaiserschmarrn, apple strudels and ice cream. 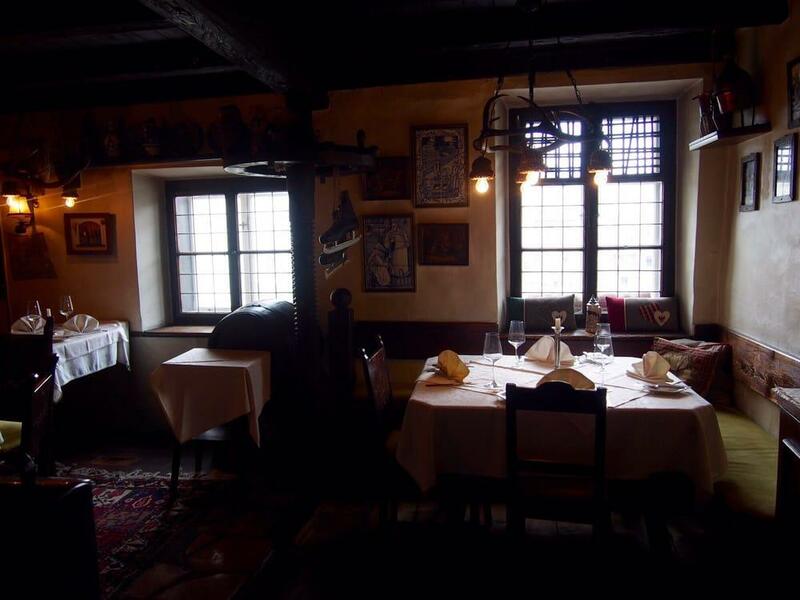 Some visitors recommend delicious house wine, lager or cordial at Zum Eulenspiegel. Order the great espresso offered here. Select between indoor and outdoor seating. Most guests state that the staff is hospitable. If you want to experience fast service, you should go to this place. In accordance with the reviewers' opinions, prices are attractive. You will definitely like the pleasant ambiance and modern decor. This spot was rated on TripAdvisor, it received 4. SCAM SCAM SCAM. The only reason I gave this place 2 stars is because the food was not bad. If not it would get only 1 star. The ambience was not very nice and it smelled very strong like cigarette smoke, as many were smoking. The place is very small but cute and centrally located. We had to sit in the bar because that's where they serve dessert. There was one waitress and she was not super helpful and ended up scamming us and lying to us. Story to follow--We went here because we heard it has good Kaiserschmarrn, which did not disappoint. In addition we ordered coffees, a tea and a coke. Everything tasted great. Although everything was very pricey once the bill came we handed the waitress our credit card and she said they don't take them. We told her there is a sign on the door saying that they do and she hesitated and said "cash cash". Meaning she was lying. Then we made the mistake of not checking the bill until after we left and noticed they did the DRINK SCAM to us too. They add a 5.20€ "savignon blanc" to our bill which we never even asked for or drank. Absolutely UNBELIEVABLE. This is the dictionary definition of lying and stealing. This has happened to multiple customers before us and is an ongoing scam. Please do not visit this restaurant and support their scam and immoral ways of running a business. SCAM SCAM SCAM. The only reason I gave this place 2 stars is because the food was not bad. If not it would get only 1 star. The ambience was not very nice and it smelled very strong like cigarette smoke, as many were smoking. The place is very small but cute and centrally located. We had to sit in the bar because that's where they serve dessert. There was one waitress and she was not super helpful and ended up scamming us and lying to us. Story to follow-- We went here because we heard it has good Kaiserschmarrn, which did not disappoint. In addition we ordered coffees, a tea and a coke. Everything tasted great. Although everything was very pricey once the bill came we handed the waitress our credit card and she said they don't take them. We told her there is a sign on the door saying that they do and she hesitated and said "cash cash". Meaning she was lying. Then we made the mistake of not checking the bill until after we left and noticed they did the DRINK SCAM to us too. They add a 5.20€ "savignon blanc" to our bill which we never even asked for or drank. Absolutely UNBELIEVABLE. This is the dictionary definition of lying and stealing. This has happened to multiple customers before us and is an ongoing scam. Please do not visit this restaurant and support their scam and immoral ways of running a business. The service and food was excellent. This restaurant was hided inside a building with classic interior design. We ordered spring chicken and beef. Waiters were very nice and good in english and willing to recommend foods. A restaurant I would recommend.